Registration will for the random drawing for purchasing tickets is open from July 12 - 18 2017. 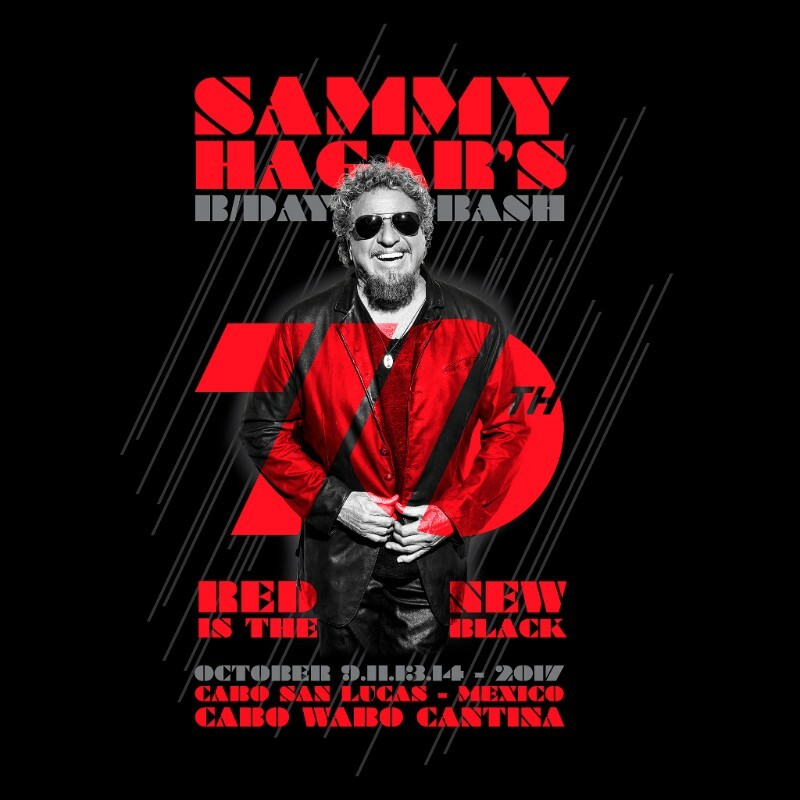 Sammy Hagar "Red Ti l'Im Dead" 70th Birthday Bash Celebration Premieres This Sunday on AXS TV! Hi Sammy, my birthday is October 13th, and I was born in salinas California, just like you. I would love to celebrate our birthdays next year. I turn 25, my dad 60, my brother 30. Awesome!! I ended up needing spine surgery on my neck after I left Cabo. I think I told you I fell in tidepool down there. Needed to fuse a disk in neck. Still rockin though. Seen Sammy 3 times since then. And will be there to see him get his award this month. Sammy is my favorite! We couldn't get tickets to the shows but we came to Cabo anyway to stand outside of his place and hopefully hear the music and party! You have the right person. I saw Sammy in Philly last month. I am back again in Cabo this year. We're really looking forward to the show on 10/14. Luckily we were able to get dinner tickets. However due to line cutters our friends in line we not. I hope the way things are done next year can prevent that from happening. After sitting in line for a day and a half and to be screwed out of tickets it's hard to swallow. Redrocker327, are you the guy who's wife was outside waiting? If so I remember you too. We stood together a while inside I think. 3 shows and I met a lot of cool Redheads. Even met Sammys son outside after one of the shows. Saw the Circle on the first show of this latest tour. In San Bernardino. Great show!! If I am buying dinner/show tickets this week, do they still check to make sure same CC is used? Can we pay cash? 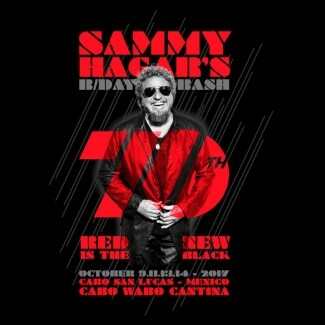 Absolutely love Sammy Hagar.. won tickets for the 13th, so stoked to see him in Cabo. Just seen him in Texas. He never fails!! always puts on a great show and enjoys it. I was there that year got into two shows, and remember seeing you inside and coming out with you from one show. But being a REDHEAD this was a dream come true. And to be in there for three shows I almost died from excitement.so ENJOY THE SHOW I KNOW YOU WILL!!! I hope after the Las Vegas event last night that security will be on high alert for Sammy's BDay Bash. We are going to the Friday concert. SAFE and fun concert!!! To the first timer wanting tips. Be prepared for long standing. You can get your wristband(s) starting around 2 on day of show you have them for. Do not take them off or try to adjust the tightness/loseness. They will not let you in if they detect tampering. Have your ID and card used to make purchase and guest at time of pick-up. The doors open at 7ish and people usually start getting in line at 4ish. The show starts 9:30ish. If your drinking alcohol pace yourself. It gets really hot inside and usually no fans going until near showtime. Your going to have a show like you have never seen. Any tips for first timers? Does it pay to get there early? How early? We have been to Cabo several times but never for the birthday bash. This is a dream come true! Any tips would be very much appreciated. I cannot wait!!! My husband and I see Sammy every chance we can! Just saw him in Denver and absolutely cannot wait for Oct 13!! The birthday bash!! 3rd time in Cabo for the birthday bash and are completely honored !! Please consider "When Eagles Fly" our son has lived that song since he could sing! Any idea on who the special guests are? I am looking for 2, 4, or 6 tickets on October 9th or 11th, or just 4 tickets on the 13th. I need 2 tix please!!! Won my second chance tickets today, so stoked!!! 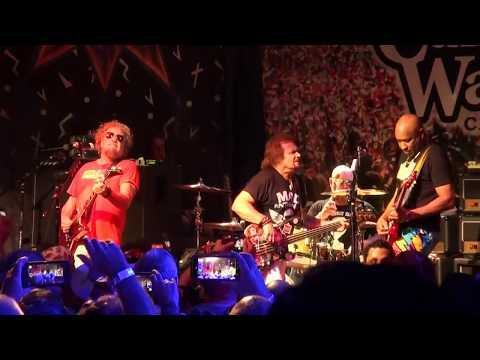 Can't wait to celebrate in Cabo, have seen Sammy more times than I can count starting all the way back in the 80's at Southern Illinois University arena, Memphis Monsters of Rock tour, Chicago with VH, he held my "5150" license plate up on stage, multiple times in St Louis with VH, Chickenfoot at the Pageant and Fox, and Riverport with The Circle last year. Bucket List... meet Cabo Wabo!!! Happy Birthday, Sammy!!! See you in October!